The Mazda MX-5 Miata has always been revered as a roadster for thrill-seekers, and while the latest generation carries on that reputation quite capably, there are still those who wish that it offered just a tad more power. According to a report from Japanese car magazine Car Watch, that tad—and then some—appears to be on the horizon. Car Watch’s Yohei Hashimoto got the opportunity to get behind the wheel of the revised Miata RF and found that its SKYACTIV-G 2.0 four-cylinder now puts out 181 horsepower and 151 lb-ft of torque, a considerable bump from the current iteration’s 155 horsepower and 148 lb-ft of torque. Mazda later confirmed the uptick in output and announced that the updated Miata will hit showrooms in Japan on July 26. It was also revealed that the Miata will see its redline jump from 6,800 rpm to 7,500 rpm, which should also go a long way to satisfy performance hounds. Other notable improvements pointed out by Car Watch include a new muffler, exhaust manifold, larger exhaust valve, larger throttle body, and a telescoping steering wheel. The lattermost of these improvements is a long overdue first for the Miata that will only make it more convenient for taller drivers (read: folks of average height). 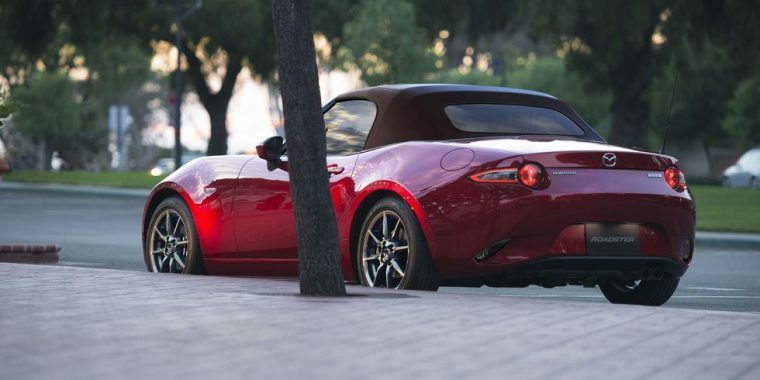 Mazda USA told Road & Track that it “can’t comment at this time” on whether the updates to the Miata will make the leap stateside for the 2019 model year. It all lines up rather nicely, however, with R&T’s discovery in March that Mazda had submitted VIN code information for the 2019 MX-5 indicating a 181-horsepower engine. In any case, it probably won’t hurt to just keep your fingers crossed.